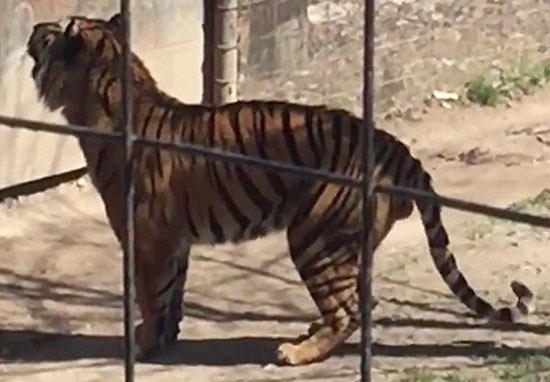 A pretty shocking video has made its rounds on the Internet showing the moment a woman jumped into a tiger enclosure in order to retrieve a lost hat. Footage shows the woman – who clearly wasn’t thinking straight – jumping down from a raised walkway and into the tiger’s enclosure at the Toronto Zoo – just to get ‘a $5 (£3.50) hat’. Where the woman jumps down, the tiger can’t actually reach her, but she’s pretty damn close. She manages to climb out unharmed, but as soon as she does, an argument breaks out between her and another visitor to the zoo – who repeatedly calls her a ‘moron’ – rightly so. At this point, the tiger – who is clearly agitated – is still pacing the edge of its enclosure. Toronto Zoo is investigating the footage and is asking witnesses to explain what happened, The Independent reports. It was very irresponsible of this individual to jump over the boardwalk and she could have easily injured herself by exciting the animal in this way. Needless to say, it’s not a very good idea to jump into a large, dangerous animal’s enclosure no matter what it is. Hopefully she’s learned her lesson.